Nowadays, I am in the middle of a busy work schedule which I thought was ‘temporary’ at first. Like other things that I postpone, I was waiting for the right time and place to write and share my little story, with a cup of coffee on the table and shed from the anxiety of being late to work. Sometimes activism needs the right time and place too… For me and my friends, working or being broke is such a common reason for not being able to go or organize an event; it is a relief to know that we will run into each other at Pride at least. When I read Hakan’s Pride story in the middle of the night, I said to myself “Yes, I have to share mine as well”. Last year’s Pride March was my first Pride as well. In the previous years I was mostly held back by my make-up exams – I’m not lazy, studying medicine is hard work- and more importantly visibility was a problem for me. I was thinking that I would be somehow visible among the tens of thousands of people and not having an Istanbulite koli  to stay with and being poor had impacts as well. 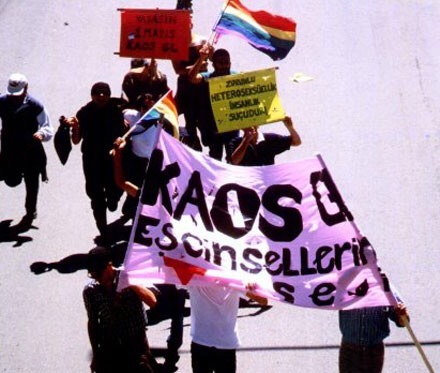 Hundreds of people got together in Mersin for the 2nd Pride March after Pride Week. Mersin 7 Colors LGBT Association and numerous civil society organizations completed Pride Week on 5 June with Pride March. Pride Week events were organized around the theme “Enigma” and included photography exhibitions, film screenings, and panels for a week, hosting many guests. On 5 June, the crowd gathered around Forum fountain with their colorful costumes and marched with slogans. People of all sexual orientations joined the highly-attended events and voiced their demands, songs, and slogans. The slogans included “The state will be led by a fag”, “queers coming with lollipops”, “we are trans but not transforming from this road”, “Ivana Hoffman lives in our love”, “Revolution’s martyrs are eternal”. Ivana Hoffman, a lesbian internationalist fighter who died in Rojava fighting ISIS was remembered. Some onlookers insulted and screamed “fag” at the crowd that had started the march with great excitement from Forum Shopping Mall. But the crowd shouted back saying, “So what if we are fags, get used to it, we are everywhere”. After the enthusiastic march, the group walked to the shore and ended the march there.